This entry is constructed around ‘samples’ of other people’s blog posts or writings mentioning “Pump Up The Volume”. Even saying that feels absurd and a little pompous – they’re just links, right? In the way that samples now are just… samples. If you listen to 21st century pop you experience them as content, not as process, with the occasional exception – Girl Talk for instance. But “Pump Up The Volume” got at least some of its power from the sample-as-process, the surprise and delight of cut ups, that videogame sense of micro-events coming at you in random attack formations. Actually “Pump Up The Volume”‘s pace isn’t particularly fast – the track feels roomy, a sandbox of possibilities bounded by that loping bassline. It’s nice to imagine that this is down to AR Kane’s interest in dub, though the participants have suggested the ‘collaboration’ was fractious and the dreampop band’s contribution to the hit side of this double-A came down to little more than guitar overdubs. Whatever the inspiration, it means “Pump Up The Volume” has aged more gracefully than some of the spatchcocked sampladelia that followed it – though I love almost all its imitator records too. Also, those slices of echoing guitar are the ingredient that gives this single its enduring strangeness – alien noises cutting across the hip-hop and funk sources “Pump” mostly draws on: as a proportion of the record they’re minor, but they’re also what makes it special. Like “Jack Your Body”, “Pump Up The Volume” was another step towards club culture’s takeover of UK pop. But while “JYB” was an unexpected shot of purism in the compromised land of the top 10, “Volume” is a wild hybrid, made by intrigued outsiders. Which makes its success even odder – imagine the Dirty Projectors’ “Stillness Is The Move” getting to #1, maybe? The record is as much hip-hop as house – it owes more to Grandmaster Flash and Steinski than to Chicago musicians, and I’d guess hit bigger as a pop event than a club one. The DJ house strain of club music “Pump Up The Volume” helped birth burned itself out fairly quickly because it was incestuous in terms of sample sources and easy to parody, and because unpredictable juxtaposition isn’t a consistently useful strategy on the dancefloor. But “Pump” itself chose its samples well and set them well too: the bassline working as a tour guide, and that sly top-end ripple on the drum track giving the record an intimacy where most sample workouts simply used novelty and brashness. We peep through a hidden door into a different record, hear Dunya Yunis sing, then shut it again and stroll on. “bewilderment gave way to enthusiasm and we had a hit on our hands”. 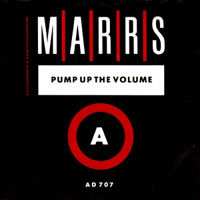 Whatever its place in the wider story of dance music, for me “Pump Up The Volume” was a moment of pop crisis. I’d overlooked or ignored “Jack Your Body” but M/A/R/R/S was more strange and striking – and I despised it. Its rejection of structure, of tune, of identification points seemed close to nihilist: this simply wasn’t music as I could recognise it. This state of mind is hard to recover now – dance music and hip-hop have rewired how I hear music to the extent that it’s ended up being rock I’ve had to re-learn how to listen to. What seemed like a destruction of everything I associated with music now seems like a blueprint for so much I enjoy about it: an equal and opposite exaggeration, perhaps, but this record is still a milestone for me. definitely a ten – the 90s start here with an intoxicating mix of hip hop, house, indie and anything else they could throw in – and still sounding fresh. Hurray! Well done, Tom – one of the absolute high water marks of pop. This getting to number one was a reaffirmation of pop’s ability to beguile, to turn and face the strange. I really liked this at the time, but fourth form reaction was generally as dismissive as the 14 year-old Tom’s. The U2-embracing majority rejected it for its alien-ness, while the small minority who liked club things disliked it for a perceived silliness and lack of authenticity, their stance supported by the pasted together video. I note that although it was officially billed as a double A-side you don’t mention Anitina. Understandably… AR Kane are one of my favourite late 1980s things, but I’ve never really got that song. Indeed, although I know its a heresy, I’d say that I much prefer ‘i’ to ’69′ – where the dub bits and spiralling guitars really connect together in a much more identifiably pop way, and expand and expand over four sides to create the sort of music that I hear in dreams. Number 2 watch: 2 weeks of ‘Full Metal Jacket (I Wanna Be Your Drill Instructor)’ by Abigail Mead and Nigel Goulding. That was a palpable hit amongst my peers, particularly those in the College Cadet Force. Great to see a Vaughan Oliver sleeve at number one, too! I like “i” more than 69 too – the splintery-guitar stuff I think comes over best on their early EPs anyway. But I was never a HUGE fan – Simon R in his Blissed Out phase had an enviable knack for making stuff sound world-changing on paper that didn’t do a lot for me when I actually heard it. Interesting about the “inauthenticity” reaction – I wondered if something like that happened. Clear ten – wonderful, wonderful record. I’ve revisited this many times over the years and it’s never sounded dated or even anything less than the future to me. Maybe because of its very strange elements – the voyager-passage guitar, that clattery break, the slowness – it’s always felt worlds beyond its genre, whatever that is. This is a record I like a lot, but I’ve never *loved* it in the same way as I have a certain 1988 #1 that I’ve always mentally filed it next to. The video however – OMG dance music lives in SPACE! Of course it does! However could we have thought otherwise? An interesting comment about this track from a source that I am definitely allowed to share with the world er um: “Press cuttings indicate legal proceedings imminent by Stock, Aitken, Waterman as writers of ‘Roadblock’, no claim received yet.” What happened with this? Colourbox are still the legal royalty recipients at the moment. It’s not still 1 April is it? I swear I’ve been to bed and woken up several times since the last entry. Ghastly noise. Irritating and devoid of emotion. I had to turn it off after two minutes and reach for the codeine. I’m surprised and delighted that this is a 10 – thought only I would go that far. For starters I just love the beat, I mean the actual sound of it. People eulogise the TR-808 bassdrum but the snappy punch of (what sounds like) the 909 snare and hats are just as great. Obviously this effect can be felt on numerous other electro tracks from the time but they don’t have to contend with quite as much as what else is going on here and the general medley-like construction of the track. The bassline, comparable to Fleetwood Mac’s ‘Oh Well’ (at least in the context of the Ben Liebrand-remixed cover version that would appear two years after PUTV), is brilliantly bouncy and elastic. The low digital piano note and crashing Horn-esque thuds could be a nod to ‘Relax’ as much as to the scratchadelic medley effect of ‘The Adventures Of Grandmaster Flash On The Wheels Of Steel’. As well as the first two FGTH #1s a few other chart-topper connections can be made. The eerie screeching and heavily-echoed guitar must be one of the most ‘extreme’ sounds to feature on a #1 up until then, harking back to ‘Voodoo Chile’ at least. A more tenuous connection with another past #1 might be ‘Telstar’ due to the off-world connotations hinted at in the music (and fully thrusted in the face with the music video’s marvellous NASA footage…partly inspired by Blondie’s ‘The Tide Is High’ promo?) combined with it’s “instrumental” nature. Not only does PUTV sample a dozen or more other tracks (in doing so introducing many of us to them), it reminds me of all these other great important records from before, several of which had also topped the charts. It pays tribute to them while matching them for greatness and importance – from that greatest and most important location, the centre of the dancefloor ultraverse. The samples are fascinatingly selected, arranged and recontextualised and I enjoy the irony of the primary sample coming from a recent hip-hop track. PUTV apes the ‘megamix’ trend of the times, akin to Mirage’s Jack Mixes, Steinski’s cut-ups and the aforementioned TAOGFOTWOS? But unlike the latter there’s no real attempt to demonstrate “live” DJ craft here, just a similarly sequenced parade of ideas and moments (in love) from other grooves. I spent years not really thinking about the original records they came from but last year started going about tracking them down (there are lists/guides on YouTube, handily). My favourite moment is probably the introduction of the break from The Bar-Kays excellent ‘Holy Ghost’ just after the notorious ‘Roadblock’ sample. Sped up, the huge drums clatter and collide into each other but without their effect spoiled. And yes ‘Anitina’ is very good too. A triumph all-round for 4AD and certainly my favourite double A side #1. Kat – the original recording did indeed include that S/A/W sample; I seem to remember that the single was re-pressed with the offending sample removed and replaced by a (not as good) soundalike. There were clearly sample clearance issues in the states as well – the version I (unwittingly) downloaded somewhere has enough different samples to almost sound like a different record. Also, on a personal note, this one marks my debut as a singles buyer. I’d been listening to and enjoying the charts for a while, but this was the first one I loved enough (and had enough spare pocket money for) to actually go out and buy. Unlike 14 year old Tom, 13 year old me absolutely adored it for sounding so utterly unlike anything in the charts, it really sounded like the future to me and it totally deserves that 10. Isn’t it a mis-conception that Ofra Haza is sampled on this tho? It is actually Dunya Yunis apparently (after the “put the needle on the record…” bit). People seemed to apply Haza’s name to the section following the international success of ‘Im Nin Alu’ a year or so later but they really don’t even sound alike! I’d certainly never call it a bad song, but the idea of being attached to music like “Pump Up the Volume,” that’s just something that’s never going to happen for me. It’s a fine song, but there’s something in me that won’t accept something this far from tune and traditional structure as something I’d actively adopt as part of me. I thought this was fun but I never really felt it – when I think 1987 I think “Fascinated” and “Take It Off” and “I Know You Got Soul” and Deborah Allen and Roxanne Shanté and Vivien Vee, so this feels pale in comparison. But then, I was hearing with ears that had long since known dance mix medleys and “Looking For A Perfect Beat” and Flash and Steinski, not to mention years of Jamaican “versions,” so mix and match wasn’t the thrill it’d be in teen Britain (or middle America, I imagine). Geoff: the Wikipedia entry on the single has a really great table showing the 5 different versions and which samples feature in which. I think it loses energy when the bass drops out. Also: How many actual mixes of this are there? And yes, Erik B and Rakim weren’t very happy! Of course both the Paid In Full remix and PUTV were playfully mocked in Star Turn On 45 Pints ‘Pump Up The Bitter’ and LA Mix’s ‘Check This Out’. If you were a sampler you were a samplee. PUTV’s beat itself was used wholesale on Cappella’s debut single ‘Bauhaus’, prior to the more successful ‘Heylom Halib’. My April 1988 7″ Top 20 smash copy of Im Nin’Alu (as purchased in Lewisham WH Smiths) is on WEA. Hurrah! It’s always a great Popular moment when a truly-deserving record like this gets a 10. Like I Feel Love this house/hip-hop hybrid is a milestone; setting the blueprint for a whole new kind of dance music. Most of the 90’s dance records I love owe some amount of debt to this. But it’s not just it’s influence that grants it a perfect score, but the music that is so awe-inspiring. The bassline, drums, echo-drenched guitar, and fascinating selection of samples make this a true cut-and-paste dancefloor extravaganza. A tried-and-true 10. “both the Paid In Full remix and PUTV were playfully mocked in Star Turn On 45 Pints ‘Pump Up The Bitter’” – more an act of witless – and borderline racist – desecration than playful mockery in my book. Which Radio 1 DJ was responsible for the success of that again? Batesy? The hairy monster? It was as if the Baron Knights had never gone away. LA Mix were fun, though. I can’t actually remember anything about Pump Up The Bitter except the “chorus” as it were. Did it offend Yorkshiremen? It has an unfortunate cameo from “Mrs Patel”. You can however always tell a genre’s importance from whether comedy pisstake records get into the charts. We can blame DLT for this, I’ve discovered. A bit of a strange one in how this was received. with it sort of being perceived as “unauthentic” – whatever that meant!. But it translated as PUTV never receiving much airplay on the pirates or being spun at “proper” dance clubs. Was this because at this stage being accepted in the dance world was still subject to the whims of a sort of closed shop? – having said that CJ Mackintosh (who I didn’t even know was involved till now) and Dave Dorell were undeniably from that world. But I suppose the fact that I never knew who WAS involved in making this track until now speaks volumes for how relatively little it did permeate into the underground dance world which I was now fully immersed in again – my time making the industrial-cleaners and reluctantly listening to Radio 1 at work having just ended). The very similar in concept “Just Give The DJ A Break” by Dynamix II from the same year IIRC had no similar problems and was even played occasionally on Summer of Love pirates the next year. Maybe the snobbery existed because it was hiphop which more than any type of scene was extremely precious about who it was “ok to like”. Does anyone else have any thoughts on the roots of such musical “snobbery”? One route to disdain — or indifference — might be the label it actually came out on simply not being plugged into the usual information exchange? Coldcut’s solution to this in a few month’s time — if i’m not mistaken — was to put “Hey Kids What Time Is It?” out on a (fake) white label until it gathered momentum and cachet, then set up their record company on the back of it.